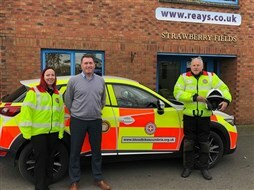 Following another successful year of operating a Charity of the Year initiative, Reays Coaches are delighted to announce Blood Bikes Cumbria as their new charity partner for 2019. Blood Bikes Cumbria was originally established by local volunteers as a medical courier service to deliver essential blood and urgent medical supplies out of hours for the North Cumbria University Hospitals NHS Trust between premises in North and West Cumbria. Outside normal office hours, hospitals rely on taxis or couriers to transfer urgent medical supplies or test samples between hospitals and other sites. In critical situations, blood or other medical items need to be delivered urgently in order to save a patients life. 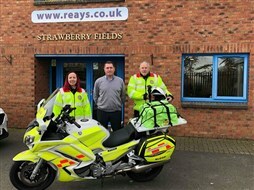 Blood Bike groups, across the country, offer to carry out this service free of charge, ensuring the limited resources of the NHS can be used where it makes a difference. Blood Bikes Cumbria funding comes entirely from charitable donations and the service is provided solely by volunteers, giving their own free time to help others. Kerrie Allison, Head of Sales & Marketing at Reays Coaches said: Our Charity of the Year initiative is something we are very proud of. This year we received more than 20 applications from local charities and choosing our nominated charity for 2019 was extremely difficult. Blood Bikes Cumbria stood out due to the team of likeminded members who all freely give their time and make no charge for their services. As NHS budgets are continually stretched and as remote and rural as our region is, Blood Bikes Cumbria is saving our hospitals thousands of pounds which can then be spent on other vital service areas, more importantly theyre saving lives. Appointing Blood Bikes Cumbria as our Charity of the Year will support the charity to provide and develop their facilities for local people and we couldnt think of a better charity to support in 2019! 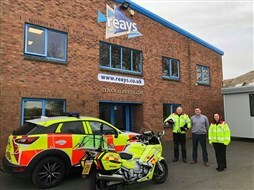 Tony Rutherford, Vice Chairperson of Blood Bikes Cumbria said: We are extremely honoured and privileged that Reays Coaches have taken us onboard as their nominated Charity of the Year. As Kerrie has already said, Blood Bikes Cumbria relies totally on our dedicated volunteers time, donations and sponsors to keep us operational. This enables us to provide a free and professional, voluntary, out of hours, daily transport service to our local North Cumbria University Hospitals NHS Trust plus Northumbrias Tyneside NHS hospitals and the NHS Newcastle Blood Donor Centre. Come rain, hail, snow or shine we provide a service throughout the night, at weekends and bank holidays with our fleet of motorcycles and cars carrying urgent blood products, plasma, samples, platelets, patient notes, donor breast milk, theatre equipment etc. between hospitals. We also transport blood 365 days per year to and from the Great North Air Ambulance based at Langwathby, near Penrith. In addition to our regular daily runs we have call-outs which are ad-hoc runs between hospitals often required at a moments notice. In 2018 these extra call outs totalled 165 and thankfully we had sufficient drivers to accommodate these. Last year our vehicles total mileage was in excess of 108,000 miles. We currently have 108 members and were always keen to encourage new volunteers to join us. In February and March 2019, we are planning recruitment promotions both in the East and West of the county for riders, drivers, controllers and fundraisers. These events will be advertised shortly via social media. To learn more about Reays Coaches Charity of the Year initiative or to apply to be next years chosen charity visit www.reays.co.uk/In-The-Community.